Case Type Snapper DVD Extras: Production Notes, 2 Trailer, Audio Commentary Track by Paul Heller and Michael Allin, Unseen footage not seen in theatres, Isolated Music Score, Private Vidoes, Behind-the-scenes documentary, TV Spots, All-New Documentary: Bruce Lee In His Own words, All-New Introduction and interview with Linda Lee Cadwell, Still Gallery, Tribute to Jackie Chan and much more. The ultimate martial arts movie! This is really a classic. 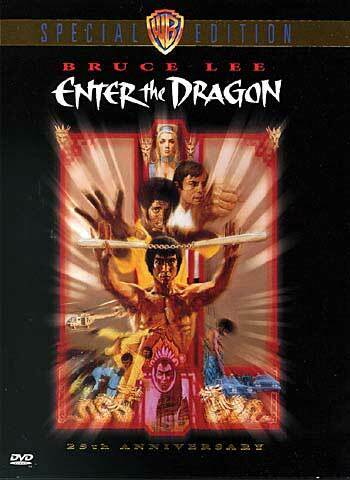 Enter the Dragon is Bruce Lee`s dream and masterpiece. Seeing this movie on dvd is amazing. The sound and picturequality is restored and fully digitalized to give you the ultimate viewing experience. Enter the Dragon contains the best fighting sequences in the history of filmmaking. It is not hard to understand why Bruce Lee became a legend. 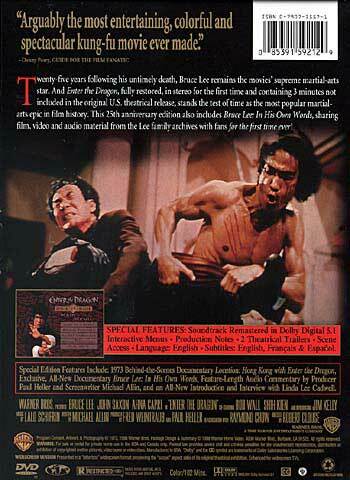 The dvd also contains rear extra material from the Lee`s private footage, as well as Bruce Lee by his own words. Highly recommanded to all fans of martial arts, and if you`re not, - my guess is that you`ll be. On a scale from 1-6, this is deffently a 6.